In the spirit of trying things that have less fat and sugar content, this Cocio One Chocolate Milk has 1% fat and 1% added sugar. 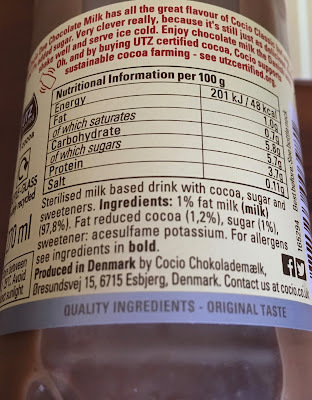 Produced by Cocio Chokolademaelk, in Denmark, this Cocio One is said to have all the flavour of the Classic drink, but a little healthier for those that still like the chocolate hit, but not the hit to their waist. Of course being a seasoned blogger I had to buy both bottles, first downing the Classic to know just what that chocolate milk drink tastes like before braving this new One. On popping open the top of the Cocio One I couldn't tell much difference from the chocolate milk smell compared to the Classic chocolate milk drink. On taste this drink does taste slightly more chocolatey than the Classic somehow. Only slightly, but when you've just immediately drank the Classic compared to this One, there is the slightest of difference. It actually tastes slightly nicer. Both taste great of course and perfect for a cool refreshing liquid pudding. Both are made with UTZ certified cocoa and therefore support sustainable cocoa farming. I'd go with either or, but prefer this One slightly more for the tiny amount more of a chocolate hit. Only tiny though. Great stuff! The 270ml (281g) bottle contains 48calories per 100g, with 1g of fat, 5.7g of sugar, and 0.11g of salt. Please see photograph for ingredients.